The WolfPack ended its tenure in collegiate soccer amongst the league’s elite on Saturday, coming back from the Canadian Collegiate Athletic Association’s (CCAA) national championships with podium finishes in both the men’s and women’s soccer tournaments. 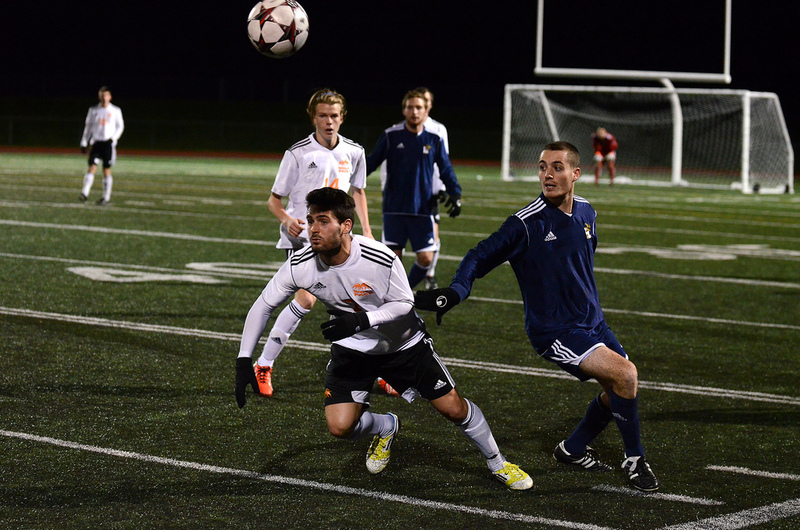 The WolfPack men’s soccer team returned to Kamloops as silver medallists, while the women will be returning with bronze around their necks. For the men’s program, it’s the first medal since the University College of the Cariboo Sun Demons won gold in 1998. For the women, the bronze ends a five-year medal drought, dating back to 2008 when the team brought home silver. TRU’s men’s program finishes its time in the CCAA with one gold and one silver medal to its credit, while the women’s program finishes with one gold medal, seven silver and a bronze. Despite bringing home the first medal in 15 years for the men’s program, falling short in the gold medal game – the men were defeated, 2-0, by Ontario’s Humber College Hawks – left a dark cloud hanging over what was otherwise a successful week for the WolfPack men. The WolfPack men were undefeated at the national championship heading into the gold medal match. En route to the final they had played to victories against Halifax’s Mount Saint Vincent University Mystics, 3-0, and Edmonton’s MacEwan Griffins, 2-1. The Hawks were the only team ranked higher than the WolfPack entering tournament play – No. 1 to the WolfPack’s No. 2 – and left with gold to the WolfPack’s silver. The national tournament, which took place over the last week in Saint John, N.B., will be the WolfPack’s final championship as a part of the CCAA. It will join the Canada West division of the CIS league next season – Canada’s highest level of university athletics. The men finished the season with 14 victories, three losses and two draws. They depart the CCAA as defending provincial champions. For the WolfPack’s women’s squad, the tournament ended on a more positive note – with a victory. TRU defeated the Algonquin College Thunder, also of Ontario, 2-0 in the bronze medal match. The medal was vindication, of sorts, for the women, who had their sights set on gold but saw those dreams come to an end with a 1-0 loss to the NAIT Ooks in the team’s first tournament match on Nov. 6. Playing in its third bronze medal match in as many years on Nov. 9, the WolfPack wrapped up the bronze medal that had eluded it in previous trips to nationals. “The last few years we’ve been in this match and come up short so this year we were a little disappointed we didn’t get to the gold medal, but I’ll take this one,” said WolfPack goalkeeper Emily Edmundson in a news release. After losing to the Ooks, the WolfPack played to a 5-0 victory against the host Kwantlen Eagles and a 4-1 victory against the defending-champion Ahuntsic Indiennes of Montreal to secure its bronze medal match berth. Head coach Tom McManus felt the match against the Indiennes was one in which the WolfPack felt it had something to prove, and winning may have given them the boost they needed entering the match for bronze. The women finish the season with 17 victories, one loss and two draws. They leave the CCAA as defending provincial champions. A number of WolfPack players were honoured with personal awards at their respective CCAA national championships on Tuesday. Justin Wallace, midfielder for the WolfPack men’s squad, was not playing in Saint John due to an injury sustained in the WolfPack’s provincial semifinal match. But he was named the CCAA player of the year, the league’s highest individual honour. Wallace and teammate Oriol Torres were also named to the all-Canadian team by the CCAA. At the conclusion of tournament play, Torres and teammate Kyle Logan were named to the tournament all-star team. In Surrey, Alanna Bekkering fell short in her bid for the women’s CCAA player of the year, but received her second-consecutive all-Canadian nod along with teammate and close friend Bronwyn Crawford. Following the tournament, Bekkering was also named to the tournament all-star team.